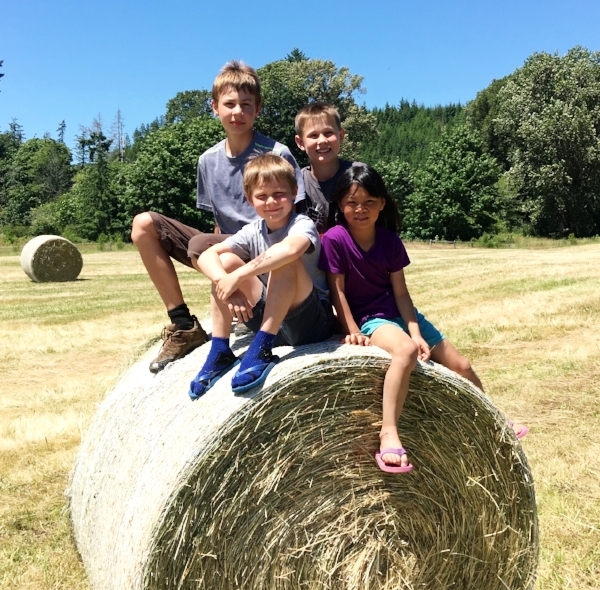 Skokomish Valley Farms is a collection of neighbors who come from diverse backgrounds. While we all have different reasons for being a part of the farm, we share a common love for the land and a strong desire to create a farm that provides delicious, wholesome food for ourselves and our community. Here are some of the team members who are working hard to bring you fresh fruits and vegetables this season. Paul and Andrea both have former careers in the military. Paul is a retired Air Force F-16 Pilot and Andrea served for 9 years in the US Army Corps of Engineers. They were drawn to the farm with a desire for a place to settle down and raise kids after all the dislocation involved with military life. They love the simple life, good food, and hard work that farm life provides. Paul is the manager for the farm's vegetable production and Andrea works on the newsletter and website. The kids love being outside and helping in the fields with planting and harvesting. David and LB are hands-on, project type people who are dedicated to the goals of regenerating tired soils and producing local, delicious food for family and friends. Having pursued careers in medicine and law, respectively, they've discovered that farming provides never-ending opportunities for learning and adventure. LB is our CSA manager, and we jokingly call David our "Agri Structural Engineer." Philip and Darlene live in Seattle and commute to the Farm while they make plans to build here. Originally from Canada where he served as a Naval officer, Philip currently works as an engineer and volunteers his technical skills to the Farm. Darlene is a former professional cook and current contributor of recipes. She is particularly passionate about tomatoes and chose the eighteen varieties we will grow this year. Besides the prospect of contributing to a healthier food system, the Barnes' came to the Farm to create a more connected life and purpose in their future retirement years. Eric and Stephanie moved from Florida in order to raise their family in such an idyllic place. Stephanie is a social worker and Eric works for the Department of Fish and Wildlife. Eric and Stephanie love being outdoors and enjoying all that nature has to offer. Being able to wake up on the farm each morning and occasionally seeing elk in the back yard is a dream come true. Eric takes care of the chickens and little Hunter loves helping by collecting the eggs.